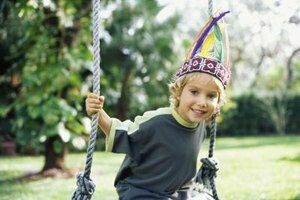 Make a simple Indian headdress to complete your child's costume. When designing costumes, your child's imagination is likely to run wild — especially when it comes to traditional Cowboys and Indians attire. This easy to make, inexpensive Indian costume can be used for your child's next Halloween costume, Thanksgiving play or simply for dressing up. Better yet — your child is sure to have hours of creative, imaginative fun once he dons this costume. The story lines will be endless! Lay a pillowcase flat with the closed, short end directly in front of you. Draw a half moon shape, about 6 inches long and 3 inches high, in the center to make the neckline. You can use a 6-inch plate to help draw the half-moon shape. Lay the plate half on, half off the edge of the pillowcase and trace it. Cut out the half moon shape through both layers of the pillowcase. And, voila — your child can now get his head through the costume. Draw two more half-moon shapes to make armholes. Make these about 3 inches long and 1/2-inch high. 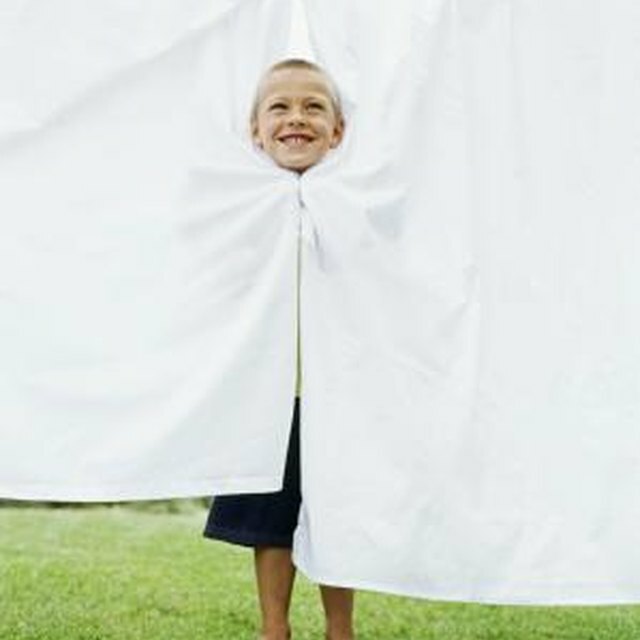 Cut out the armholes and now your youngster's costume is really starting to take shape. Make a slit upward about 1 1/2 inches at one armhole. Move over half an inch and make another slit. Continue all the way around the armhole to make a fringe. Repeat for the other armhole. Try the costume on your child. The bottom of the pillowcase should rest about calf-length. If it's longer than that, trim the costume down so your child doesn't trip over his costume. Lay the pillowcase flat with the open bottom end in front of you. Make a slit upward about 3 inches, move over 1/2-inch and make another slit. Continue all the way around the open end of the pillowcase to make a fringe for the costume. Cut a sponge into a triangle shape with jagged edges all the way around and then fill a shallow bowl with fabric paint. Measure up about 4 inches from the open end of the pillowcase. Dip the sponge in the paint and then make an upside-down triangle on the pillowcase. Repeat all the way across one side, leaving about an inch in between each triangle. Dip another jagged triangle-shaped sponge into different-color fabric paint. Make a row of right-side-up triangles on the pillowcase above the upside-down triangles. Position each new triangle in between two triangles on the upside down row. After the paint dries, flip over the pillowcase and repeat the above step. Embellish the neckline of the costume with a store-bought fringe or make your own from the excess pillowcase you cut off earlier. Cut a fringe along the extra piece and then pin it around the neckline. Glue the fringe in place using fabric glue, or you can sew it in place.